Canada’s Arctic ice floes are more than just picturesque pieces of scenery that fuel our imaginations with thrilling images of Inuit hunters and barking herds of seals. They are also home to majestic polar bears, who depend on the sea ice as a platform for hunting, breeding and making dens where they will give birth to their cubs. Sadly, the melting ice is putting not only the future of polar bears at risk, but the entire ecosystem as well. That’s because sea ice is more than just a base camp of sorts for polar bears and other animals. The salt in the water actually creates bubbles in the ice where micro-organisms grow. These small organisms play a key role in the Arctic food chain, ending with seals and then polar bears. In recognition of the mighty polar and other fauna living in its vast arctic wilderness, the Royal Canadian Mint has issued the first release in its new Canadian Fauna series. Struck in a full ounce of 99.99% silver, it features a doting mother polar bear and her adorable cub nuzzling while the sun sets in the background. The smooth design on this $20 legal-tender coin is augmented by the use of selective colorization with the words “2019” and “CANADA” engraved into the relief design of a cracked ice floe. Each 2019 Canada Fauna Polar Bear One-Ounce Colorized Silver Coin in this offer will come in gorgeous Proof condition, meaning it was expertly crafted by the mint from hand-selected planchets, polished dies and multiple strikes to produce beautifully frosted details rising over mirror-like fields. These proofs will also arrive in their original government packaging and accompanied by a mint-issued certificate of authenticity. In addition, the Mint has limited this release to just 4,000 and, much like ice floes that the polar bears of Canada’s Arctic wilderness depend on for survival, they’re quickly disappearing, too. Don’t miss your chance to get the first coin in the Canadian Fauna series with the 2019 Canada $20 Fauna Polar Bear One-Ounce Colorized Silver Proof. Click one to your cart before our supply melts away! FIRST RELEASE IN CANADA’S FAUNA SERIES – This coin is the first release in the Canadian Fauna series. It features a mother polar bear and her cub nuzzling while the sun sets in the background. 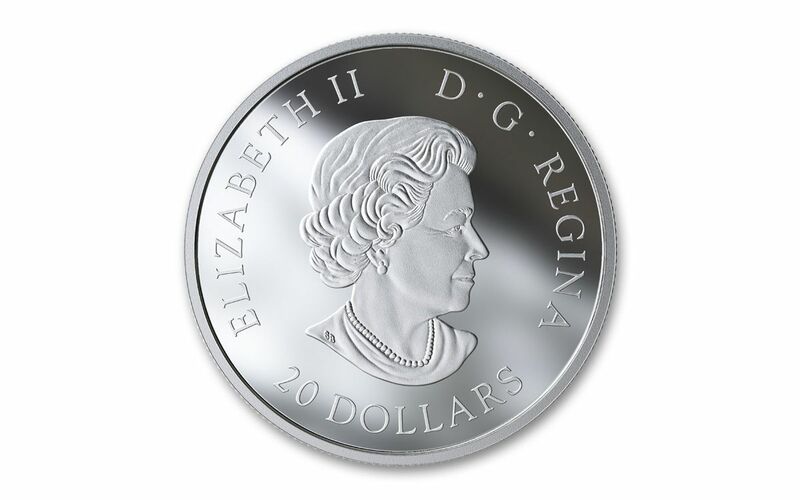 The smooth design is augmented by the use of selective colorization as well as the words “2019” and “CANADA” engraved into the relief design of a cracked ice floe featured on the coin’s surface. The regal portrait of Queen Elizabeth II is shown on the coin’s obverse. STRUCK IN HIGHLY-PURE SILVER – Each Canada Fauna Polar Bear Colorized Silver Coin has been struck in one ounce of highly-pure 99.99% silver. 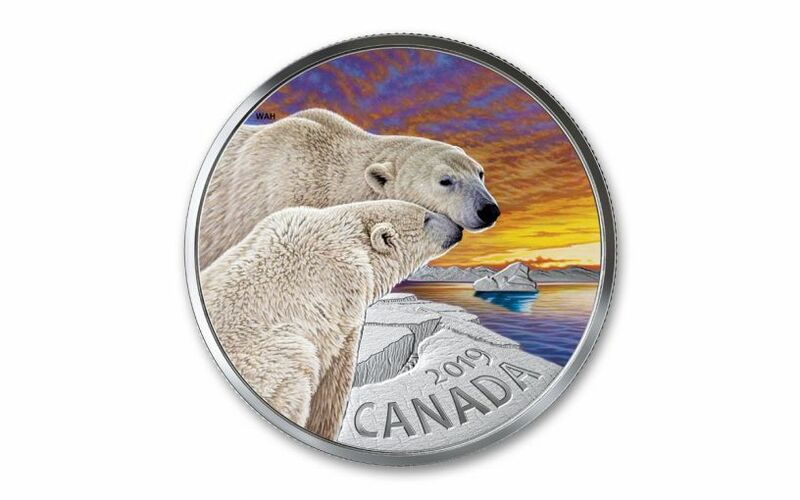 CANADIAN LEGAL TENDER – These 2019 Canada Fauna Polar Bear One-Ounce Colorized Silver Coins are $20 legal tender in Canada. GORGEOUS PROOF CONDITION – Your 2019 Canada Fauna Polar Bear One-Ounce Colorized Silver Coin will come in gorgeous Proof condition, meaning it was expertly crafted by the mint from hand-selected planchets, polished dies and multiple strikes to produce beautifully frosted details rising over mirror-like fields. LOW WORLDWIDE LIMITED EDITION – The Royal Canadian Mint set the worldwide mintage for this coin at just 4,000. ORIGINAL GOVERNMENT PACKAGING – Your 2019 Canada Fauna Polar Bear One-Ounce Colorized Silver Coin will come in its original government packaging and accompanied by a mint-issued certificate of authenticity. Don’t get left out in the cold – secure your 2019 Canada $20 Fauna Polar Bear One-Ounce Colorized Silver Proof today!